Are you hungering for your portrait in pizza? Commission one from Domenico Crolla. A native of Glasgow, Scotland, where his Italian-born father Alfredo had a café, Chef Crolla graduated from the Scottish Hotel School and launched his first restaurant, a pizzeria. His next Glasgow restaurant, Italmania, became Scotland’s very first designer pizza emporium. It closed in 2008 to be replaced with a full-service Italian restaurant, Bella Napoli. But the thrill of pizza remains, especially in Chef Crolla’s pizza portraits of celebrities from Beyoncé to Andy Warhol (how Andy would have loved that!) He even turned the iconic photo of Prince William, Duchess Kate and baby Prince George into pizza art. Don’t think of him as a pizza chef, but as a culinary artist. 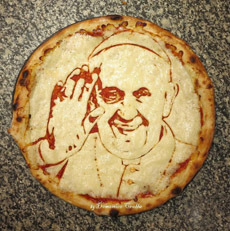 The Pope in pizza. Photo courtesy Domenico Crolla. When he isn’t creating pizza art or running his restaurants, Chef Crolla judges cooking contests across the globe. Discover more at Crolla.com and check out the celebrity pizzas on his Facebook page.